I present to you a cake in the form of favorite Ukrainian product — sandwich lard. However lard is not real, but sweet. 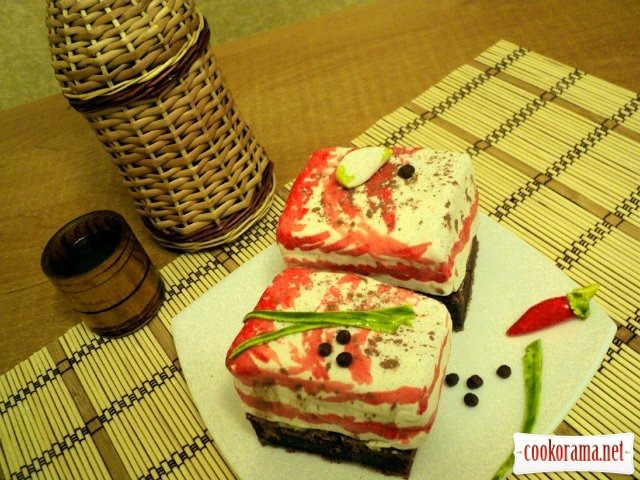 This playful and delicious cake can surprise your loved ones! Defrost cherries, remove seeds, pour with cognac. 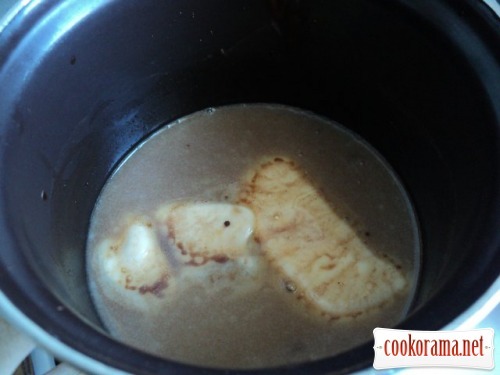 For chocolate biscuit: put sugar in hot water, butter, cocoa, soda and bring to a boil and cook over low heat for 5 min. Mass will foam, so stir constantly. Then, remove mixture from heat and cool to 40℃. Add slightly mixed eggs, flour, mixed with baking powder, and mix for 3 min till white and smooth mass. 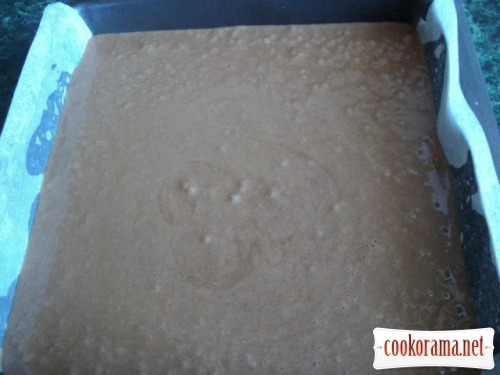 Cover baking sheet with baking paper, grease with butter, pour dough. Bake at 170 C for 40-45 min. White biscuit: mix 2 eggs with 100 g of sugar on water bath (bowl with eggs should not touch water) till increasing in volume in 3-4 times. 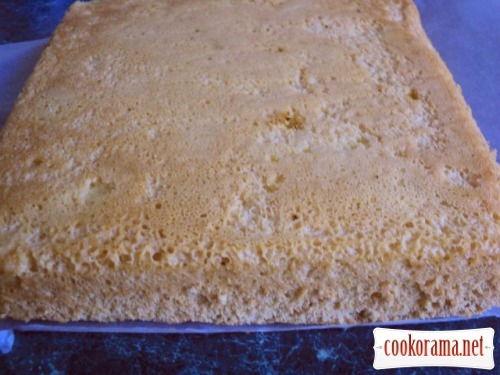 Remove egg mixture from water mass add gently add flour mixture with baking powder (80 g of flour and 1 tsp of baking powder). Stir till smooth mass. Cover bottom of baking form with baking paper, with butter, pour dough. Bake at 170 C for 15-20 min. Cool it, flipping biscuit on grid. 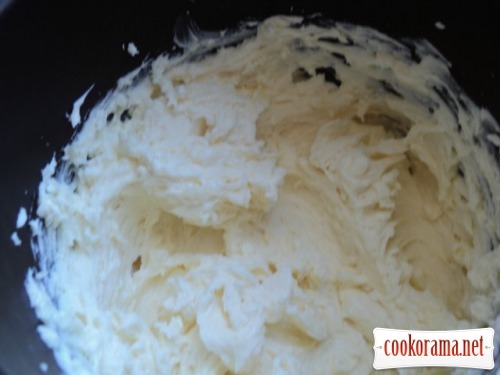 Mix softened butter with condensed milk. 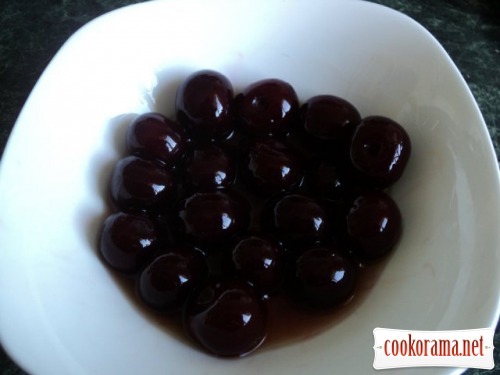 Cut white biscuit in two layers and soak with cognac, in which cherries were. 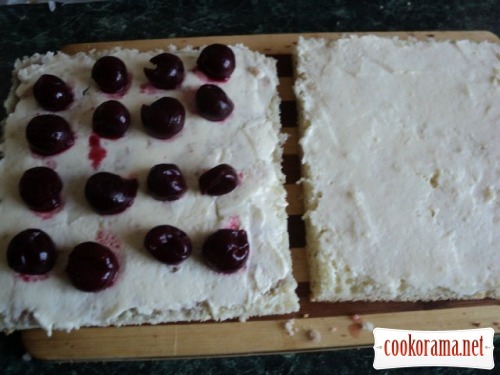 Smear both flat cakes with cream, spread on one layer cherries, cover with second layer, with smeared side. Also smear with cream top and sides. Put in the fridge for 30 min. 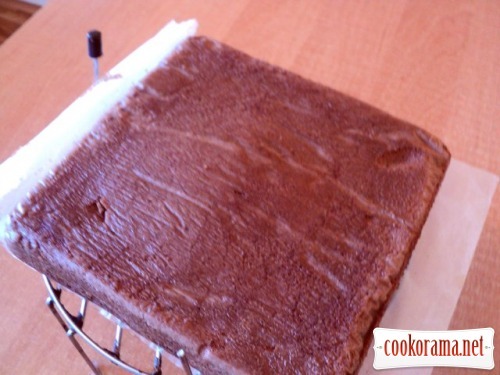 Cut chocolate flat cake and white biscuit with cream into 6 parts. Also smear sides of white biscuit in cut places with cream. 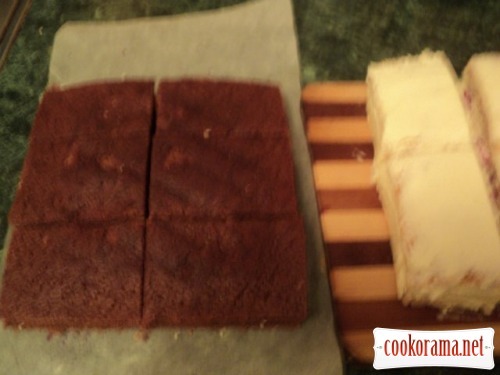 Roll out white mastic thinly, cut rectangles and wrap white part of cake. Smear with cream chocolate part of cake and set on top white part. Colorize white mastic of cake as lard by food coloring diluted in vodka. Also make mastic pepper, clove of garlic, onions. 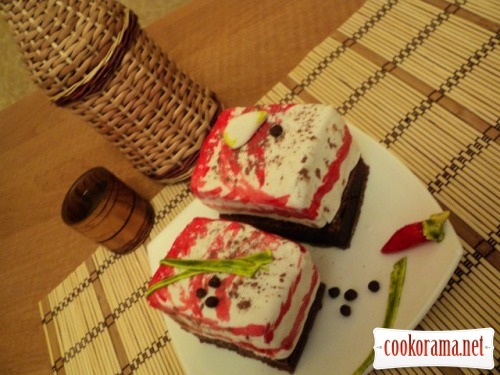 Top of recipe "Cake "Sandwich with lard""
Яке ж сало без 100гр! Дякую! Колоритное пирожное в национальном украинском стиле!!! молодец!!! Спасибо, Наташа! Особенно, думаю, мужчин порадует! Замечательный «бутерброд»! И с твоей любимой мастикой! Для тех кто «не любит» сладкое! Для тех, кто любит сладкое и сало! Достойний «шматок сала» для справжнього українця! Для справжнього українця багато сала не буває! ЗдОрово получилось! Главное что вкусно! Міла а можете поділитися рецептом мастіки? Recipes, Pastries, Cake "Sandwich with lard"